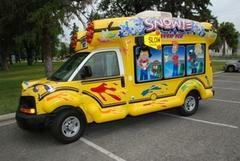 When you are looking for something new and exciting for your upcoming event, try our extremely popular Snowie Bus. Great for people of all ages! 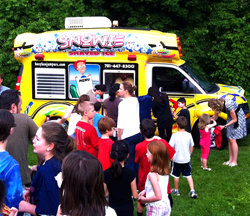 With (2) serving windows our staff can serve up to 400 snow cones within the hour. Rent $300 per hour or ask our office about our profit share! Serving 10 delicious syrups at (2) flavor stations donate a portion of the proceeds back to the non-profit. We provide the ice, snow cone cups and spoons! Excellent for: profit share programs, school events, church outings, sporting events or large backyard events. The Snowie bus has eye catching designs, LED lighting throughout, PA sound system and surround sound speakers with electronic hookup for customized music play list..
Click the Title or Image Below for more information and to see the Snowie Video!